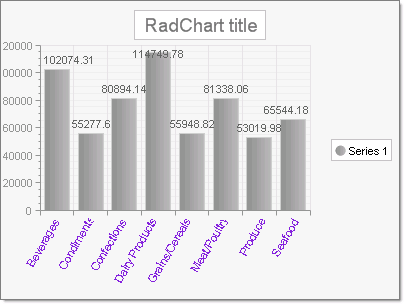 To bind to a database, create a data source object, assign the data source to the RadChart and call the RadChart DataBind() method. Creates a SqlDataSource, adds it to the page, assigns the RadChart DataSourceID property and finally binds to the data source. Displays data for a database column by assigning the series DataYColumn or DataXColumn properties. In the example the "TotalSales" column is assigned to the DataYColumn property. Displays database column data in the X axis labels by assigning the column name to the DataLabelsColumn. The example assigns "CategoryName" to the DataLabelsColumn property. Also note how the example sets the PlotArea.Appearance.Dimensions.Margins.Bottom to 30% and the PlotArea.XAxis.Appearance.LabelAppearance.RotationAngle to 300 in order to provide room for the axis labels. // X-axis will show "CategoryName. sqlDataSource.SelectCommand = "SELECT CategoryName, SUM(ProductSales) AS TotalSales FROM [Product Sales for 1997] GROUP BY CategoryName"
' X-axis will show "CategoryName.